Birthday Cakes Traditional frosting or fondant cakes. Two, three or more layers of sizes 12, 16, 24 inches. Baby Showers Cute cupcakes for your guests or a large round/sheet cake to satisfy everyone. Specialty Cupcakes Personalized designs to match just about any occasion you may have. Minimum order is a dozen. Class Reunions Everyone loves cake no matter if they are still trying to impress their former classmates. Anniversaries They only come around once per year so treat your lady, or man, to with a wonderful memory. Office Party Have a special event? Go over the top and impress everyone with decorative cupcakes. Chocolate Pears I've been experimenting with these little wonders. 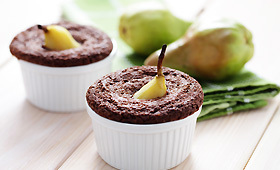 Mini chocolate cakes with a pear. 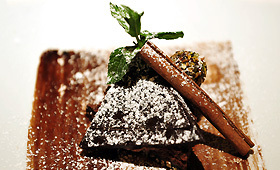 The chocolate cake is infused with pear juice and baked until a moist perfection is achieved. So far, so gooood! Apple Cinnamon Tarts A moist chocolate pastry filled with warm apples slices topped with cinnamon and sugar. I'm thinking of offering them by the dozen which seems about right for a intimate party.